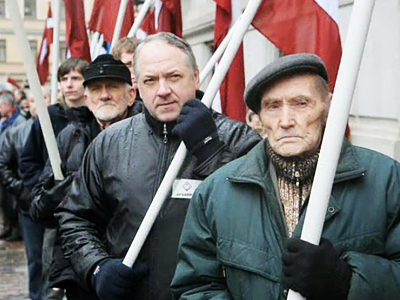 A group of Latvians protested against former Waffen SS legionnaires, who assembled and marched in downtown Riga on Wednesday. ­Parades of former Latvian soldiers who fought against the Soviet Union on the side of Nazi Germany have become annual events since the break-up of the USSR. 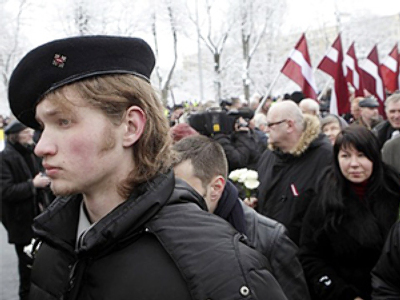 During Wednesday’s ceremonies, about one thousand veterans, as usual, laid flowers at the Freedom Monument in Riga, singing nationalist songs. 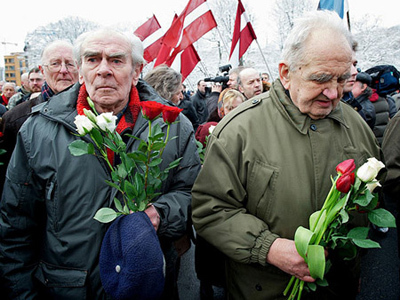 They were supported by members of Latvian nationalist organizations. However, the anti-fascists, many of whom were disguised as Nazi concentration camp prisoners, were outnumbered by their opponents. The Waffen SS veterans received strong backing from many nationalist deputies of the Latvian parliament. Police had labored to prevent possible clashes between the protestors and the Nazi march backers. The space around the monument was fenced off by metallic barriers and the two parties were divided by a wall of policemen. Latvian Interior Minister, Linda Murniece was closely eyeing the work of the city’s police force. The Riga city council had attempted to prevent possible clashes between nationalists and anti-fascists and banned the events in the city. But a city administrative court on Tuesday granted permission for the controversial tribute to roughly 140,000 men who fought against the USSR. Two Latvian Waffen-SS divisions were created in 1943. On March 16, 1944, they engaged in combat against the Red Army. That date is considered the legion’s birthday, and it was celebrated for several years in post-Soviet Latvia. But as marches of Waffen-SS veterans have persistently sparked outrage from anti-fascists in Latvia, Russia and the West, March 16 ceased to be an official commemoration date in the country. Latvian Prime Minister told local media last week he did not think March 16 had “a special significance.” Legionnaires’ Day is used by radicals on both sides “to confront each other,” he noted. However, anti-fascists insist that the leadership of Latvia should condemn the Nazi event in clearer terms as Waffen SS veterans are not seen as legitimate “heroes” in any EU member state. A recent survey conducted in Latvia showed that 38 per cent of respondents believe the actions commemorating Nazi legionnaires should not be prevented. However, 44 per cent of those polled want any events on March 16 to be banned completely.